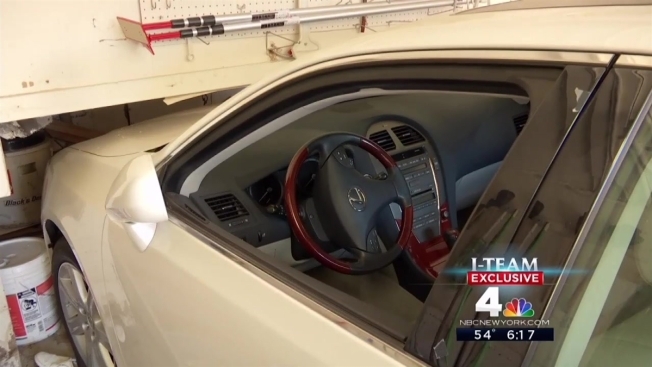 Class action lawsuits directed at car manufacturers point to the potential dangers of keyless ignition systems that are becoming ubiquitous in nearly every new car that is purchased, an I-Team investigation has found. Mary Rivera of Whitestone, Queens, blames the keyless ignition in her 2008 Lexus sedan for her brain damage and the death of her boyfriend, Ernie Codelia. In 2009, Rivera and Codelia, came home from dinner and they parked their car in the garage and went to bed. Twelve hours later, Rivera's brother found Codelia lying dead in their bed and Rivera sprawled on the floor, clinging to life. While they slept, their car had been running overnight, sending odorless, colorless toxic fumes into their home. Codelia died of carbon monoxide poisoning. Rivera said she thought she had turned off her keyless ignition with "that push button." That apparently wasn't the case. Though she survived, the former Fordham University professor has changed drastically since her boyfriend's death. She used to be active and played sports. These days, she needs a walker to get around and a chairlift to go up and down the stairs of her house. “I’m depressed because I can't do the things that I could do before,” said Rivera. “I could swim and play tennis." Rivera's lawyer, Noah Kushlefsky blames the keyless ignition. "It's an inexcusable design flaw to have a vehicle where you can remove the key FOB,” said Kushlefsky, “Leave your car with that device and your car is left running and it will run for an indeterminate amount of time." Kushlefsky sued Toyota, the maker of Lexus, on Rivera's behalf. They settled that case last year. He also started a class action lawsuit against Toyota. Toyota declined to comment, but the company has previously denied allegations that its keyless ignition system is defective and violates federal safety standards. Another attorney, Martis Alex, recently filed a class action against 10 automakers of keyless ignition vehicle, accusing them of false advertising and deceptive practices. Her lawsuit demands car makers install an "auto off" feature that would kill the engine if the car idles for an extended period of time. “If they can put auto-off on your interior lights to save you an inconvenience, why can’t we put auto-off on the engine to save your life?” Alex said. The trend of quiet engines also contributes to the problem, experts say. "They have made it very easy for you to inadvertently leave the car running and not know it,” said Sean Kane, a car safety researcher and advocate. The I-Team has learned that the National Highway Traffic Safety Administration considered keyless ignitions a problem five years ago. In 2011, the federal agency published a notice of proposed rulemaking where transportation officials acknowledged that "keyless ignition" increased the chances of "carbon monoxide poisoning in an enclosed area." But still, years later, those proposals aren't even close to becoming the law. The NHTSA says it is gathering data that could lead to new rules, but the agency offers no timetable. According to Kushlefsky, there have been 13 deaths nationwide since Codelia's, and there have been countless other non-fatal incidents that are underreported. The I-Team reached out to all the car makers named in the class action suit and most declined comment. Mercedes Benz said their customers can choose to operate their vehicles as a "normal keyed ignition system, simply by removing the stop/start button." As for Rivera, learning to walk again and adjusting to her life has been a slow process. She says she would have died in no one had found her. "And sometimes I wish I had," she said. Rivera did not have working carbon monoxide detectors at her home. While there is no time frame for new rules around keyless ignitions to be implemented, authorities say making sure you have working carbon monoxide detectors in your home is a crucial, simple way to protect yourself and your family.